Put Your Toe in the Water and Transform Your Old Mattress With a Latex Topper! If your current mattress is “talking to you in a bad way” that isn’t giving you a good nights’ sleep but your budget isn’t quite ready to help you “talk back” maybe you need to put your toe in the water and try out a latex mattress topper. 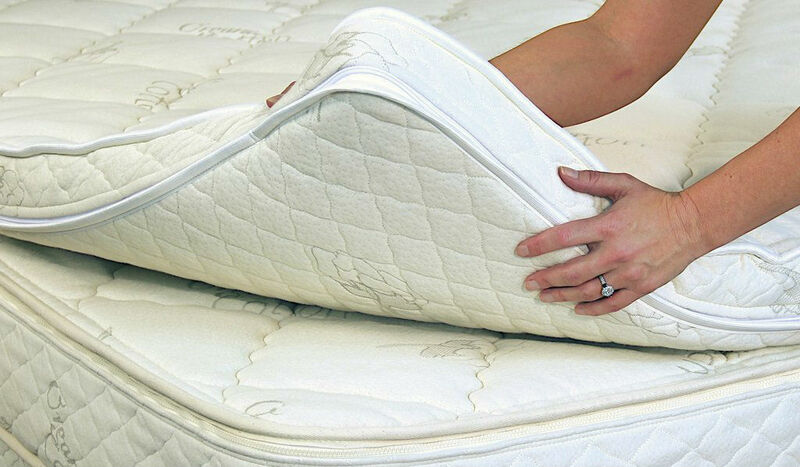 You may have an innerspring mattress where you can almost count the coils pushing back at you each night. Putting a latex topper on top of the mattress will help relieve those pressure points. Latex has been around for 80 years in mattresses and is a great cushioning material. Latex toppers are generally available in thicknesses from 1 inch to 3 inches and in numerous firmnesses from soft to extra firm. If you’re sleeping on a mattress that’s just a little bit bad to you all you might need is a one inch soft topper to change the feel next to the body to give you a softer feel. However, if your mattress is at the other extreme you’ll most likely be more pleased with a 3 inch topper to feel some relief from the mattress underneath. Toppers are available in organic green or all natural latex and blended latex. Some of the benefits latex lovers know and enjoy are these facts about latex. It’s all natural, no chemicals, hypoallergenic, dust mite and mold resistant, totally conforms to the body contour, gives support to the hips and shoulders maintaining proper spinal alignment, is very resilient, doesn’t lose its shape, doesn’t change its feel in extremely cold weather, sleeps warmer in winter and cooler in summer, is not affected by your body heat, and when latex is used in a mattress it will last twice as long as a conventional innerspring mattress. What’s not to love here? So maybe a topper is the test run you need to introduce yourself to the world of latex. When you’re ready to discard the bad-for-the-body mattress and move full speed ahead with the purchase of a latex mattress your topper will still have a long life as part of your bed makeup. It’s been my experience that once a person feels just how good latex is to sleep on they are pretty anxious to have the entire mattress under them made of latex–not just the top! Additionally, if you mention that you already own a 3 inch topper when you further decide to shop for a mattress some manufacturers will make your latex mattress for you with a zippered cover large enough to encase the new mattress and your topper all in one. Just something to consider. Either way I think you’ll love the feel of latex! For a complete look at our latex mattress toppers please visit our website today http://www.sleepez.com. You’ll find a complete explanation to all your questions on the different types of latex in our LATEX MATTRESS CONSUMER BUYING GUIDE. Sleep EZ is a third generation mattress manufacturer in business for 36 years. We introduced latex mattresses into our line 15 years ago because we realized all the benefits of latex. We offer a complete line of latex mattresses. See our Select Sleep line where we assist in your own custom configuration for your next mattress where you can select different firmnesses on the layers of your mattress. Additionally, we can make it a duplex mattress where you and your partner can select your individual preference of firmness. Dealing factory direct saves you money–and Customer Service is our middle name.